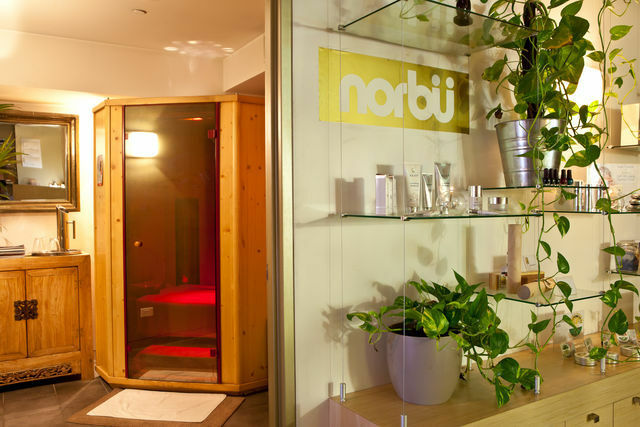 Infrared therapy is a favourite at Norbü - the detox box is brilliant on its own and even better as an accompaniment to massage, facial, scrub or endermologie treatment. The detox box increases circulation and is great for sore muscles, jet lag, insomnia, lactic acid build up, detoxification, weight loss, arthritis, high blood pressure, and your immune system. Two people can go into the box together to enjoy at the same time, or separately in our two different boxes. 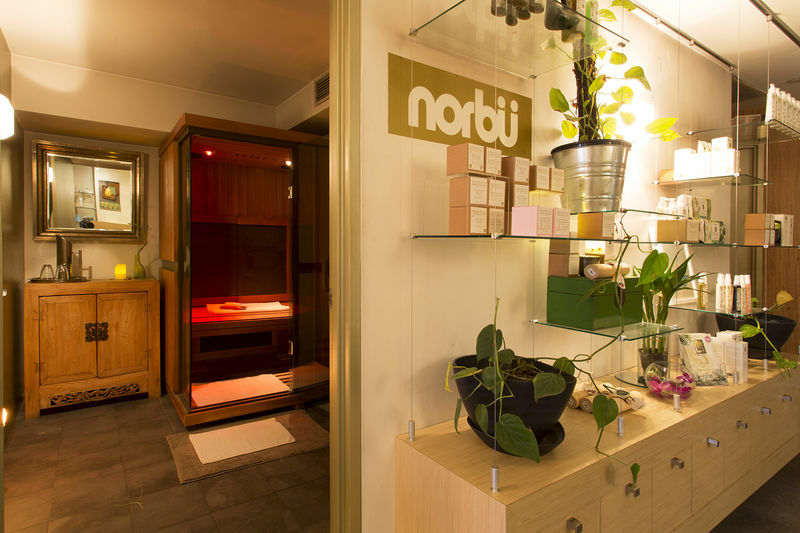 Couples and friends will often detox together after their massages at Norbü. A session in the detox box rejuvenates the body and the mind. 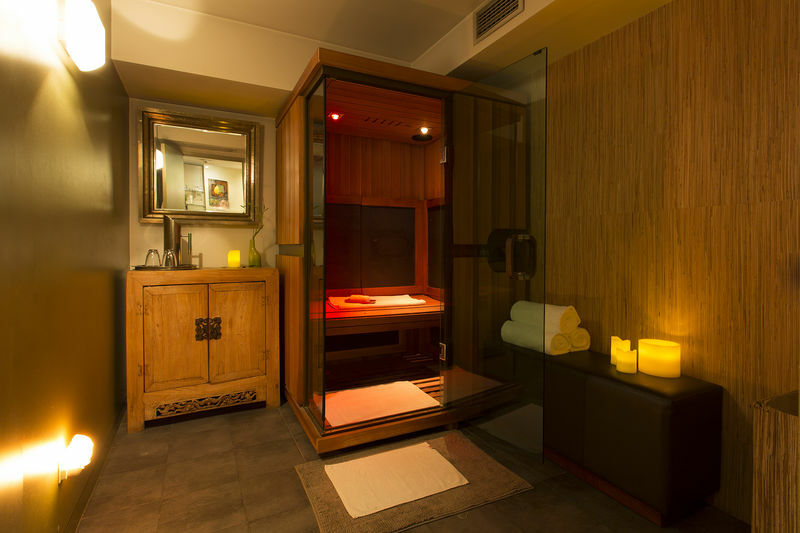 Relax as the deep soothing heat of non-harmful infrared rays operate at lower temperatures than traditional saunas. Warming between 30-60 degrees, the far infrared penetrates up to 45mm into your body. This causes the blood vessels to dilate, oxygenating the tissues and increasing lymphatic drainage to stimulate metabolism and detoxify the body, bringing relief to inflamed muscles. The detox box is a safe, effective and enjoyable way to rid the body of unwanted chemicals and wastes. Take the load off your liver and kidneys as toxins are eliminated directly through the skin. The detox box assists your body in mobilising stored fat, which becomes water soluble around 42 degrees, and is then expelled from the body via sweat. Burns calories by raising the body's basal metabolic rate, continuing to burn at a higher level for several hours afterward. Removes heavy metals, pesticides, and environmental chemicals that are stored within. Decreases stored fat (lypolyptic) toxins - often weight loss cannot be achieved until these toxins are removed. Improves skin texture by helping to develop and maintain the body's capillary network that carries vital oxygen and nutrients to the skin. Scientific analysis shows infrared heat induced sweat contains 5-6 times more toxins, fat, and impurities than normal sweat. Relax in the detox box and enjoy its unsurpassed ability to eliminate stored waste (metabolic wastes, environmental toxins, city pollution, fat, cholesterol, heavy metals, alcohol, nicotine. (source: Zane R. Gard, MD & Erma J. Brown, BSN, PhN TLfDP, October 1992).
" ... with the infrared sauna we are talking about reversing disease, getting rid of underlying causes, and therefore getting rid of the symptoms once and for all. We are talking about restoring the body to a level of chemicals it had maybe 20-50 years ago." Our body expends energy to produce sweat (1g sweat requires 0.586 kcal) meaning your body can safely burn up to 800 calories in just one 30-minute session; with sweat loss equivalent to running 10-15km. While this weight can be regained through drinking water, the calories consumed will not. A detox box session can also help to raise your basal metabolic rate, meaning you will burn calories at an elevated rate for hours after your session has finished. At 42 degrees Celsius, body fat becomes water soluble and can be eliminated through sweating. The detox box's deep acting infrared heat helps to develop and maintain the body's capillary network. This increases the blood circulation especially to your skin's surface. Together with infrared heat's super cleansing effect, you will see a noticeable improvement in your skin's texture, complexion and tone. It can also remove skin roughness, soothe damage from scaring, and even help UV damage, leaving your skin feeling baby smooth and soft. Prepare to glow! Beauty specialists in Europe regularly incorporate daily sweat sessions in programmes specifically designed to reduce cellulite. Because the radiant heat warms three times as deeply as conventional saunas and aids in the break down and release of stored fat and toxins through the skin, it is significantly more effective at reducing cellulite and promoting smoother skin. Detox box devotees attest to its amazing ability to reduce and even remove completely the pain associated with various muscle and joint problems; from poor sitting positions and over work to more chronic ailments such as osteo- and rheumatoid arthritis and fibromyalgia, giving a safe, natural pain relief without medication. The detox box is prescribed by European medical professionals for treatment of these conditions. Stress and anxiety melt away in the soothing warmth and comfort of your private detox box. Your senses are further treated with sensual aromas, soothing colour therapy and relaxing music. Infrared therapy has been shown to promote a rebalancing of the body's hormones through its effect on the autonomic nervous system, reducing the negative physical impact of stress on the body. A 25 minute session helps to truly rebalance both the mind and body. As your body is warmed, the entire cardiovascular system is dilated to increase blood flow to the surface of the skin and the extremities in order to dissipate heat. This means your heart works harder, pumping blood at a greater rate to boost circulation, supplying the conditioning benefits of continuous exercise. Heart rate, cardiac output, and metabolic rate increase, while diastolic blood pressure drops, for improved overall cardiovascular fitness. A German study showed reduced blood pressure in patients with hypertension for at least 24 hours after infrared therapy. Scientific research suggests that infrared therapy helps the body's cells to work at a more optimal level, including greater efficiency of absorbing nutrients and removing wastes and producing more ATP - the cells source of energy. Healthy cells help make a healthy body! Full spectrum sunlight alone has been shown to have dramatic effects on lifting the winter blues. So by combining the radiant warmth of infrared heat, soothing choice of colour, and aromas of the box, the total effect is a whole body experience, with each therapy working synergistically to effectively rebalance the body and enhance your mood. A session can offer a respite from the coldest, wettest and darkest Melbourne day. The deep, radiant infrared heat raises your body temperature, inducing a type of artificial fever. As the body works to combat this "fever" your body's immune system is stimulated and strengthened. Combined with the elimination of toxins and wastes produced by intense sweating your overall health and resistance to disease can be improved. Whether you are still on a different time zone, working too late, or have overindulged with late night socialising, the detox box can quickly help get you back on track. Either before bed to promote deep, restful sleep, or after a big night out to help flush out the excesses of the night before. The sunlight function is safe and great before and after flying to combat jet lag. Be it a sore back from golf, tired legs from cycling, or even damaged tendons and muscles from the rugby field, the detox box is highly effective in promoting the body's natural healing processes. As proven over many decades by the sports medical profession. Infrared sauna therapy is used by the US Olympic team and NASA. Before exercise or a massage simply get in the sauna with clothes on and wait until just before starting to sweat.
" Tissues heated to 45°C and then stretched exhibit a non-elastic residual elongation of about 0.5-0.9% that persists after the stretch is removed, which does not occur in these same tissues at normal temperatures. Thus 20 stretching sessions can produce 10-18% increase in length of tissues so heated and stretched." Justus F Lehmann M.D., Williams and Wilkins, Therapeutic Heat and Cold, 4th edition. 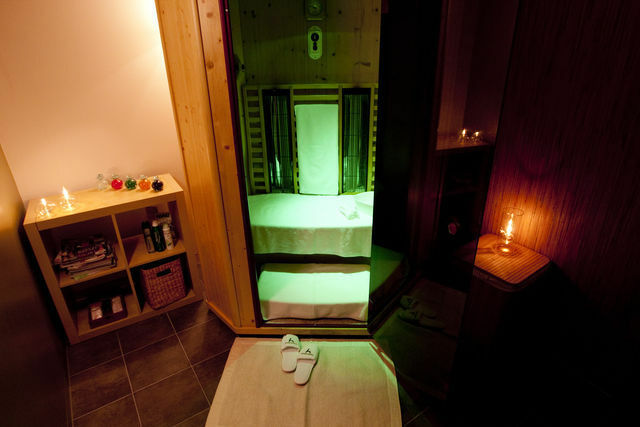 Unlike a traditional sauna, the detox box is perfectly safe from childhood to advanced age. From hyperactive kids and stressed adults, to the elderly, the box presents a safe and effective treatment to promote enhanced wellbeing and quality of life. In just 20 minutes you will feel relaxed, rejuvenated, revitalised and rebalanced, having burned lots of calories in the pleasant heat of 32-65C.